From the moment he walked on stage to deliver the opening chords of "Eight Days a Week," it was clear that Sir Paul McCartney was going to cater to the audience's sappy sense of nostalgia — in the best way possible. The man delivered everything that the 80,000 onlookers could have hoped for in a three-hour, triple encore set. Wings fans were treated to "Junior's Farm," "Listen to What the Man Said" and "Let Me Roll It" early in the night, while Beatles classic "All My Loving" received a thundering sing-along response. Macca's "back in the '60s" anecdote about Jimi Hendrix and Eric Clapton was endearing and led the way into "Paperback Writer," which was followed by the only recent tune of the night, a rendition of "My Valentine" for his current wife Nancy. It didn't get near the response, however, that "Maybe I'm Amazed" did when the Wings frontman reminded everyone that he'd written it for Linda. Linda McCartney wasn't the only one remembered on Friday night; following a rendition of "Blackbird," Macca dedicated a gorgeous rendition of "Here Today" to John Lennon — a moment that probably got the biggest cheer of the night once the crowd was instructed to "give it up for John." Written in the form of a missed conversation with his Beatles partner and leaving things unsaid, the short song was a poignant moment in an otherwise exciting and upbeat show. The audience was also treated to "Lovely Rita" and "Being for the Benefit of Mr. Kite," which McCartney has only begun breaking out on his current tour, before he paid his respects to another Beatle. His George Harrison tribute started with a gorgeous solo ukulele version of "Something" that turned into a full-band affair by the end of the song. 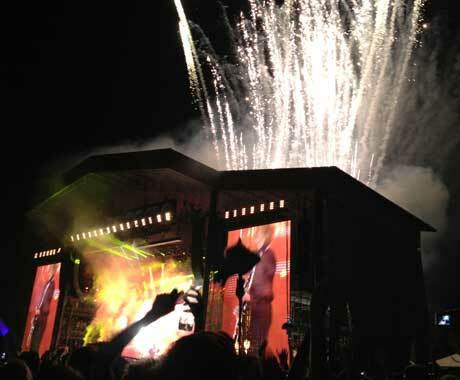 Live staple "Live and Let Die" was a late highlight in the set, kicking off an impressive round of pyrotechnics and fireworks that shot far above the giant stage, with McCartney firmly planted behind his piano. Closing with what seemed like at least a ten-minute version of "Hey Jude" that had everyone singing and swaying along, McCartney left fans wanting more — and followed up with three encores. "Day Tripper," "Hi, Hi, Hi" and "Get Back" kept things rocking during the first, followed by "Yesterday" and "Helter Skelter," and finally the Abbey Road trilogy of "Golden Slumbers," "Carry That Weight" and "The End," sent off a fond farewell to a astonished crowd that would be talking about Macca's set for the rest of the weekend. It may have been in line with what McCartney usually does on stage as one of the world's biggest performers, but there's still something so spectacular about a crowd this massive and this appreciative that even a Beatle had to pause to take it in.